Proper Hunt: Would you like some Accessories with that? Would you like some Accessories with that? Accessories are the side dishes, if you will (it was the only analogy I could come up with! ), of home furnishings. And just like a side dish, you shouldn't forget how essential they are to enhancing your existing pieces. They add that extra little bit that makes a home feel lived in. Your experiences and feelings show through the items that are displayed around your house. Whether it's a plate set that you picked up along your travels in Istanbul to hidden gems from a neighborhood yard sale, all of these things define who you are/were at the time you acquired them. They may not all "go together" in a traditional sense, but they all work together because they embody you. Don't ever feel like you can't buy something because it won't go with anything else in your house. Think outside of the box. Sometimes the more eclectic a room is, the more engaging it can be. It will spark lots of conversation and won't ever let you get bored of it. Think about that now. That's one way to save money, because then you won't feel like you need to keep updating your house by buying new things constantly. Now, that's not to say that you can have pieces from all different eras in one room and think it will work (i.e. 70s green shaggy carpet with a Hollywood Regency bedroom set). Just make sure you have one thing that ties it all together whether it's a color, pattern, or texture. I don't mean that everything should be the same color or pattern, but just make sure that the colors and fabrics complement rather than fight each other. My home is nowhere close to the level that I would like it to be as far as being completely furnished and decorated. However, there are a few pieces that I really enjoy and would like to share with you. 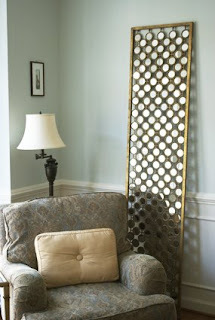 Our living room nook that houses this unique mirror. 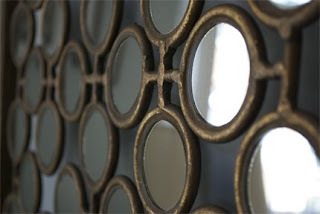 One does not envision a mirror that looks like this on their own, rather they happen upon it just like we did. A quick hop to Anthropologie turned into a big item purchasing day since we just couldn't help but fall for it really hard. It's one of those pieces that you could literally plop anywhere and it will just add that bit of spark. The gold finish is more on the antique side while the design is very modern which encompasses both old and new allowing it to be used anywhere. 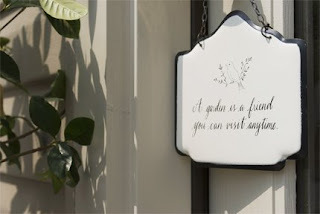 Our garden sign leading to the kitchen from the deck with our almost dying gardenia tree to the left (sniff sniff). I purchased this from good ol' TJ Maxx (another great resource) but you can find them at a few different places. My husband was a little iffy with this item, but only because it's a bit more on the girlier side. I think it's so very Parisian (oh la la) and I had to have it because I am a complete francophile. 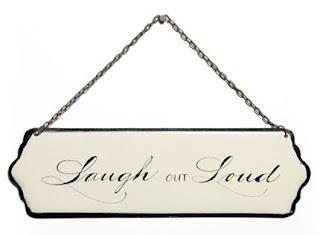 South Moon Under has them and I am especially keen on this $15.95 "Laugh Out Loud" tin sign. 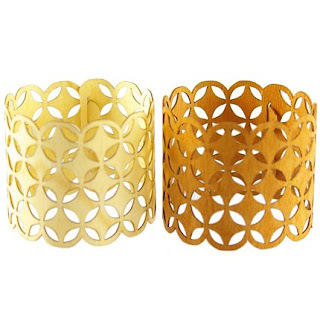 Check out these innovative napkin rings! Made by Sarah Finn, these are laser cut veneers which have two different designs that you can choose from. They lock into place with these mini tabs on one end allowing you to re-flatten them for better storage. 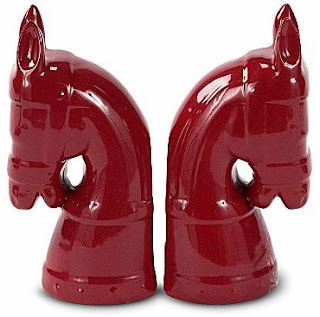 Artesia™ Horse Head Figurine from JCPenney for $19.99. I've wanted to own bookends for a long time now but seeing as how we don't own enough bookshelves to have any (we only have 1 bookshelf right now) I can only covet from afar. These Horse Head Figurines don't necessarily have to be used as bookends but I think they would look rather smart being used as that. Besides, JCPenney displays it as that so that took the guess work out! 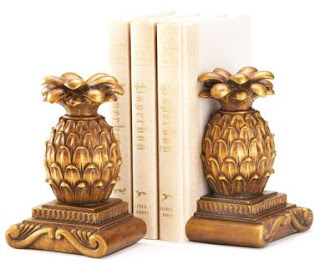 Orange Pineapple Bookends from JK Interiors Unlimited for $9.31. Why a pineapple? It was a rare and extravagant fruit that was revered in Colonial America. A guest felt honored to be offered this fruit and so now it symbolizes hospitality. Plus, it's just a fun take on something so traditional. There are only so many home accessory items I can talk about in one post so don't fret. There will be more, but we need to get back to our Local Hunts posts since I have a few more locales that I would like to share with you.